Anne Brontë (pronounced /ˈbrɒnti/) (January 17, 1820 – May 28, 1849) was a British novelist and poet, the youngest member of the Brontë literary family. The daughter of a poor Irish clergyman in the Church of England, Anne Brontë lived most of her life with her family at the remote village of Haworth on the Yorkshire moors. For a couple of years she went to a boarding school. At the age of nineteen, she left Haworth to work as a governess between 1839 and 1845. After leaving her teaching position, she fulfilled her literary ambitions. She wrote a volume of poetry with her sisters (Poems by Currer, Ellis and Acton Bell, 1846) and in short succession she wrote two novels: Agnes Grey, based upon her experiences as a governess, was published in 1847; her second and last novel, The Tenant of Wildfell Hall appeared in 1848. Anne's creative life was cut short by her death from pulmonary tuberculosis at twenty-nine years of age. Anne Brontë is often overshadowed by her more famous sisters, Charlotte, author of four novels including Jane Eyre, and Emily, author of Wuthering Heights. Anne's two novels, written in a sharp and ironic style, are completely different from the romanticism of her sisters' works. She wrote in a realistic, rather than a romantic voice. Her novels, like those of her sisters, have become classics of English literature. Anne's father, Patrick Brontë (1777-1861), was born in a meager, two-room cottage in Emdale, Loughbrickland, County Down, Ireland. He was the first of ten children born to Hugh Brunty and Eleanor McCrory, a couple of poor Irish peasant farmers. The family surname, mac Aedh Ó Proinntigh, had been earlier anglicized as Prunty, or sometimes Brunty. Struggling against poverty, Patrick learned how to read and write and from 1798, to teach others. In 1802, at the age of twenty-six, he won a place at Cambridge to study theology at St. John's College. There, he gave his original name: Brunty, and called himself by the more distinguished Brontë. In 1807, he was ordained in the priesthood in the Church of England. He served as an assistant priest or curate in various parishes and in 1810, he published his first poem, "Winter Evening Thoughts," in a local newspaper, followed in 1811, by a collection of moral verse, Cottage Poems. In 1811, he was made vicar of St. Peter's church in Hartshead in Yorkshire. The following year, he was appointed an examiner of Bible knowledge at a Wesleyan academy, Woodhouse Grove School. There, at age thirty-five, he met his future wife, Maria Branwell, the headmaster's niece. Anne's mother, Maria Branwell (1783-1821), was the daughter of a successful, property-owning grocer and tea merchant of Penzance, Thomas Branwell and Anne Crane, the daughter of a silversmith in the town. The eighth of eleven children, Maria had enjoyed all the benefits of belonging to a prosperous family in a small town. After the death of both parents within a year of each other, Maria went to help her aunt with the teaching at the school. A tiny, neat woman, aged thirty, she was well read and intelligent. Her strong Methodist faith immediately attracted Patrick Brontë. Though from vastly different backgrounds, within three months Patrick Brontë and Maria Branwell were married on December 29, 1812. Their first child, Maria (1814-1825), was born after their move to Hartshead. In 1815, Patrick was made curate of a chapel in the little village of Thornton, near Bradford; a second daughter, Elizabeth (1815-1825), was born shortly after. Four more children would follow: Charlotte, (1816-1855), Patrick Branwell (1817-1848), Emily, (1818-1848), and Anne (1820-1849). Anne, the youngest member of the Brontë family, was born on January 17, 1820, at number 74 Market Street in the village of Thornton, Bradford, Yorkshire County, England. When Anne was born, her father was the curate of Thornton and she was baptized there on March 25, 1820. Shortly after, Anne's father took a perpetual curacy, a secure but not enriching vocation, in Haworth, a remote small town some seven miles (11 km) away. In April 1820, the Brontë family moved into the Haworth Parsonage. This five-room building became the Brontë's family home for the rest of their lives. Anne was barely a year old when her mother became ill of what is believed to have been uterine cancer. Maria Branwell died on September 15, 1821. In order to provide a mother for his children, Patrick tried to remarry, but he had no success. Maria's sister, Elizabeth Branwell (1776-1842), had moved into the parsonage, initially to nurse her dying sister, but she subsequently spent the rest of her life there raising the Brontë children. She did it from a sense of duty, but she was a stern woman who expected respect, rather than love. There was little affection between her and the eldest children, but to Anne, her favorite according to tradition, she did relate. Anne shared a room with her aunt, they were particularly close, and this may have strongly influenced Anne's personality and religious beliefs. In Elizabeth Gaskell's biography, Anne's father remembered her as precocious, reporting that once, when she was four years old, in reply to his question about what a child most wanted, "she answered: Age and experience." In the summer of 1824, Patrick sent his eldest daughters Maria, Elizabeth, Charlotte and Emily to Crofton Hall, and later to the Clergy Daughter's School, Cowan Bridge, Lancashire. When the two eldest siblings died of consumption in 1825, Maria on May 6 and Elizabeth on June 15, Charlotte and Emily were immediately brought home. The unexpected deaths of Anne's two eldest sisters distressed the bereaved family enough that Patrick could not face sending them away again. For the next five years, all the Brontë children were educated at home, largely by their father and aunt. The young Brontës made little attempt to mix with others outside the parsonage, but relied upon each other for friendship and companionship. The bleak moors surrounding Haworth became their playground. 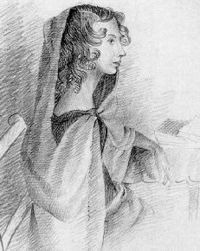 Anne Brontë, by Charlotte Brontë, 1834. Anne's studies at home included music and drawing. Anne, Emily, and Branwell had piano lessons at the parsonage from the Keighley parish organist. The Brontë children received art lessons from John Bradley of Keighley and all of them drew with some skill. Their aunt tried to make sure the girls knew how to run a household, but their minds were more inclined to literature. Their father's well-stocked library was a main source of knowledge. They read the Bible, Homer, Virgil, Shakespeare, Milton, Lord Byron, Scott, and many others, and examined articles from Blackwood's Edinburgh Magazine, Fraser's Magazine, and The Edinburgh Review. In addition, they read history, geography, and biographies. Those readings fed the Brontë's imaginations. The children's creativity soared after their father presented Branwell with a set of toy soldiers in June 1826. They named the soldiers and developed their characters, which they called the "Twelves." This led to the creation of an imaginary world: The African kingdom of "Angria." That was illustrated with maps and watercolor renderings. The children kept themselves busy devising plots about the people of Angria, and its capital city, "Glass Town," later called Verreopolis, and finally, Verdopolis. These fantasy worlds and kingdoms gradually acquired all the characteristics of the real world—sovereigns, armies, heroes, outlaws, fugitives, inns, schools, and publishers. For these peoples and lands the children created newspapers, magazines and chronicles, all of which were written out in extremely tiny books, with writing that was so small it was difficult to read without the aid of a magnifying glass. These juvenile creations and writings served as the apprenticeship of their later, literary talents. Anne, dear gentle Anne was quite different in appearance from the others, and she was her aunt's favorite. Her hair was a very pretty light brown, and fell on her neck in graceful curls. She had lovely violet-blue eyes; fine penciled eyebrows and a clear almost transparent complexion. She still pursued her studies and especially her sewing, under the surveillance of her aunt. Anne also took lessons from Charlotte, after she came back from the boarding school, at Roe Head. Later, Anne began more formal studies at Miss Wooler's school at Roe Head, Huddersfield. Charlotte returned there on July 29, 1835, as a teacher. Emily accompanied her as a pupil; her tuition largely financed by Charlotte's teaching. Within a few months, Emily was unable to adapt to life at school, and by October, was physically ill from homesickness. She was withdrawn from the school and replaced by Anne. At fifteen, it was Anne's first time away from home, and she made few friends at Roe Head. She was quiet and hard working, and determined to stay and get the education that would allow her to support herself. Anne stayed for two years, winning a good-conduct medal in December 1836, and returning home only during Christmas and the summer holidays. Anne and Charlotte do not appear to have been close during their time at Roe Head (Charlotte's letters almost never mention Anne) but Charlotte was concerned about the health of her sister. At some point before December 1837, Anne became seriously ill with gastritis and underwent a religious crisis. A Moravian minister was called to see Anne several times during her illness. Charlotte was sufficiently concerned about Anne's illness to notify Patrick Brontë, and to take Anne home where she remained to recover. Little is known about Anne's life during 1838, but in 1839, a year after leaving the school and at the age of nineteen, she was actively looking for a teaching position. As the daughter of a poor clergyman, she needed to earn a living. Her father had no private income and the parsonage would revert to the church on his death. Teaching or working as a governess in a private family were among the few options available to poor but educated women. In April 1839, Anne became a governess with the Ingham family at Blake Hall, near Mirfield. The children in Anne's charge were spoiled and wild, and persistently disobeyed and tormented her. She experienced great difficulty controlling them, and had almost no success in instilling any education. She was not empowered to inflict any punishment, and when she complained of their behavior to their parents, she received no support, but was merely criticized for not being capable of her job. The Inghams, unsatisfied with their children's progress, dismissed Anne at the end of the year. She returned home at Christmas, 1839, joining Charlotte and Emily, who had left their positions, and Branwell. The whole episode at Blake Hall was so traumatic for Anne, that she reproduced it in almost perfect detail in her later novel, Agnes Grey. At Anne's return to Haworth, she met William Weightman, Patrick's new curate, who began work in the parish in August 1839. Twenty-six years old, he had obtained a two-year licentiate in theology from the University of Durham. He quickly became welcome at the parsonage. Anne's acquaintance with William Weightman parallels the writing of a number of poems, which may suggest that she fell in love with him. There is considerable disagreement over this point. Not much outside evidence exists beyond a teasing anecdote of Charlotte's to Ellen Nussey in January 1842. It may or may not be relevant that the source of Agnes Grey 's renewed interest in poetry is the curate to whom she is attracted. As the person to whom Anne Brontë may have been attracted, William Weightman has aroused much curiosity. It seems clear that he was a good-looking, engaging young man, whose easy humor and kindness towards the Brontë sisters made a considerable impression. It is such a character that she portrays in Edward Weston and that her heroine Agnes Grey finds deeply appealing. If Anne did form an attachment to Weightman, that does not imply that he, in turn, was attracted to her. Indeed, it is entirely possible that Weightman was no more aware of her than of her sisters or their friend, Ellen Nussey. Nor does it follow that Anne believed him to be interested in her. If anything, her poems suggest just the opposite; they speak of quietly experienced but intensely felt emotions, intentionally hidden from others, without any indication of their being requited. It is also possible that an initially mild attraction to Weightman assumed increasing importance to Anne over time, in the absence of other opportunities for love, marriage, and children. Anne would have seen William Weightman on her holidays at home, particularly during the summer of 1842, when her sisters were away. He died of cholera in the same year. Anne soon obtained a second post: This time as a governess to the children of the Reverend Edmund Robinson and his wife Lydia, at Thorp Green, a wealthy country house near York. Thorp Green appeared later as Horton Lodge in her novel, Agnes Grey. Anne was to have four pupils: Lydia, age 15, Elizabeth, age 13, Mary, age 12, and Edmund, age 8. Initially, she encountered the same problems with the unruly children that she had experienced at Blake Hall. Anne missed her home and family, commenting in a diary paper, in 1841, that she did not like her situation and wished to leave it. Her own quiet, gentle disposition did not help matters. However, despite her outwardly placid appearance, Anne was determined and with the experience she gradually gained, she eventually made a success of her position, becoming well liked by her new employers. Her charges, the Robinson girls, ultimately became her lifelong friends. For the next five years, Anne spent no more than five or six weeks a year with her family, during holidays at Christmas and in June. The rest of her time she was with the Robinsons at their home Thorp Green. She was also obliged to accompany the family on their annual holidays to Scarborough. Between 1840 and 1844, Anne spent around five weeks each summer at the resort, and loved the place. A number of locations in Scarborough formed the setting for Agnes Grey's final scenes. Anne returned to Thorp Green in January 1843. She secured a position for Branwell with her employers: He was to take over from her as tutor to the Robinsons' son, Edmund, the only boy in the family, who was growing too old to be under Anne's care. However Branwell did not live in the house with the Robinson family, as Anne did. Anne's vaunted calm appears to have been the result of hard-fought battles, balancing deeply felt emotions with careful thought, a sense of responsibility, and resolute determination. All three Brontë sisters had spent time working as governesses or teachers, and all had experienced problems controlling their charges, gaining support from their employers, and coping with homesickness—but Anne was the only one who persevered and made a success of her work. Anne and Branwell continued to teach at Thorp Green for the next two years. However, Branwell was enticed into a secret relationship with his employer's wife, Lydia Robinson. When Anne and her brother returned home for the holidays in June 1845, she resigned her position. While Anne gave no reason for leaving Thorp Green, it is generally believed that she chose to leave upon becoming aware of the relationship between her brother and Mrs. Robinson. Branwell was sternly dismissed when his employer found out about his relationship with his wife. In spite of her brother's behavior, Anne retained close ties to Elizabeth and Mary Robinson, exchanging frequent letters with them even after Branwell's disgrace. The Robinson sisters came to visit Anne in December 1848. Once free of her position as a governess, Anne took Emily to visit some of the places she had come to know and love in the past five years. An initial plan of going to the sea at Scarborough fell through, and the sisters went instead to York, where Anne showed her sister the York Minster. 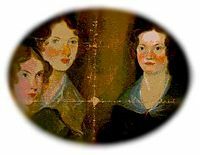 The Brontë sisters, painted by their brother, Branwell c. 1834. From left to right, Anne, Emily and Charlotte (there still remains a shadow of Branwell, which appeared after he painted himself out). In the summer of 1845, all four of the Brontës were at home with their father Patrick. None of the four had any immediate prospect of employment. It was at this point that Charlotte came across Emily's poems. They had been shared only with Anne, her partner in the world of Gondal. Charlotte proposed that they be published. Anne also revealed her own poems. Charlotte's reaction was characteristically patronizing: "I thought that these verses too had a sweet sincere pathos of their own." Eventually, though not easily, the sisters reached an agreement. They told neither Branwell, nor their father, nor their friends about what they were doing. Anne and Emily each contributed 21 poems and Charlotte with nineteen. With Aunt Branwell's money, the Brontë sisters paid to have the collection published. Afraid that their work would be judged differently if they revealed their identity as women, the book appeared under their three chosen pseudonyms—or pen-names, the initials of which were the same as their own. Charlotte became Currer Bell, Emily became Ellis Bell and Anne became Acton Bell. Poems by Currer, Ellis and Acton Bell was available for sale in May 1846. The cost of publication was about 3/4 of Anne's annual salary at Thorp Green. On May 7, 1846, the first three copies of the book were delivered to Haworth Parsonage. The volume achieved three somewhat favorable reviews, but was a dismal failure, with only two copies being sold during the first year. Anne, however, began to find a market for her more recent poetry. Both the Leeds Intelligencer and Fraser's Magazine published her poem, "The Narrow Way," under her pseudonym, Acton Bell. Four months earlier, in August, Fraser's Magazine had also published her poem, "The Three Guides." Even before the fate of the book of poems became apparent, the three sisters were working on a new project. They began to work on their first novels. Charlotte wrote The Professor, Emily Wuthering Heights and Anne Agnes Grey. By July 1846, a package with the three manuscripts was making the rounds of London publishers. After a number of rejections, Emily's Wuthering Heights and Anne's Agnes Grey were accepted by a publisher in London, but Charlotte's novel was rejected by every other publisher to whom it was sent. However, Charlotte was not long in completing her second novel, the now famous Jane Eyre, and this was immediately accepted by Smith, Elder & Co., a different publisher from Anne's and Emily's, though also located in London. However, Jane Eyre was the first to appear in print. While Anne and Emily's novels "lingered in the press," Charlotte's second novel became an immediate and resounding success. Meanwhile, Anne and Emily were obliged to pay fifty pounds to help meet the publishing costs. Their publisher, urged on by the success of Jane Eyre, finally published Emily's Wuthering Heights and Anne's Agnes Grey in December 1847. These too sold exceptionally well, but Agnes Grey was distinctly outshone by Emily's much more dramatic Wuthering Heights. Anne began Agnes Grey with the words "All true histories contain instruction," and wrote in a realistic, rather than the romantic style followed by her sisters. The title character is the younger daughter of a poor clergyman and sets out to earn a living as a governess. Anne drew strongly on her own life. Her rather plain first-person female narrator begins the story young, inexperienced, and idealistic, but strives for self-respect and independence. Agnes Grey is a wish-fulfillment story in which patience and virtue are rewarded. It is also a quiet but sharply pointed critique of the life of a governess and the instruction of children at the time. Anne portrays her characters and their surroundings with the minute attention to detail of a camera eye, focusing on the direct experience of daily life in a constrained environment, and recognizing the importance of subtle impressions. Anne's understated humor and occasional satire also remind the reader of Jane Austen. Anne's second novel, The Tenant of Wildfell Hall, was published in the last week of June 1848. It was an instant phenomenal success; within six weeks, it was sold out. In The Tenant of Wildfell Hall, the twin themes of character and education are woven throughout the novel, in the experiences of Helen, who has been poorly prepared to choose a marital partner; her husband Arthur Huntingdon; and later her young son, also named Arthur, whose father appears likely to give him the worst possible education. The novel is also a realist's response to the romanticization of violence and conflict that had occurred in her sisters' writings. Anne pointedly emphasizes the degradation of drunkenness and violence, and any initial attractiveness of her Byronic character, Huntingdon, is outweighed by her painstaking and detailed description of his degradation and death. The Tenant of Wildfell Hall is perhaps the most shocking of the Brontë's novels. In seeking to present the truth in literature, Anne's depiction of alcoholism and debauchery were profoundly disturbing to nineteenth century readers. Helen Graham, the tenant of the title, intrigues Gilbert Markham and gradually she reveals her mysterious past as an artist and wife of the dissipated Arthur Huntingdon. The novel's brilliance lies in its revelation of the position of women at the time, and its multi-layered plot. The Tenant of Wildfell Hall was an immediate success. It is easy today to underestimate the extent to which it was a challenge to existing social and legal structures. May Sinclair, in 1913, said that the slamming of Helen Huntingdon's bedroom door against her husband reverberated throughout Victorian England. Anne's heroine eventually leaves her husband to protect their young son from his influence. She supports herself and her son by painting, while living in hiding, fearful of discovery. In doing so, she violates not only social conventions, but also English law. At the time, a married woman had no independent legal existence, apart from her husband; could not own her own property, sue for divorce, or control custody of her children. If she attempted to live apart from him, her husband had the right to reclaim her. If she took their child with her, she was liable for kidnapping. In living off her own earnings, she was held to be stealing her husband's property, since any income she made was legally his. In July 1848, in order to dispel the rumor that the three "Bell brothers" were all the same person, Charlotte and Anne went to London to reveal their identities to the publisher, George Smith. The girls spent several days in his company. Many years after Anne's death, he wrote in the Cornhill Magazine his impressions of her, describing her as: "…a gentle, quiet, rather subdued person, by no means pretty, yet of a pleasing appearance. Her manner was curiously expressive of a wish for protection and encouragement, a kind of constant appeal which invited sympathy." When we have to do with vice and vicious characters, I maintain it is better to depict them as they really are than as they would wish to appear. To represent a bad thing in its least offensive light, is doubtless the most agreeable course for a writer of fiction to pursue; but is it the most honest, or the safest? Is it better to reveal the snares and pitfalls of life to the young and thoughtless traveler, or to cover them with branches and flowers? O Reader! if there were less of this delicate concealment of facts–this whispering 'Peace, peace', when there is no peace, there would be less of sin and misery to the young of both sexes who are left to wring their bitter knowledge from experience. The increasing popularity of the Bells' work led to renewed interest in the Poems by Currer, Ellis and Acton Bell, originally published by Aylott and Jones. The remaining print run was purchased by Smith and Elder, and reissued under new covers in November 1848. It still sold poorly. Branwell's health had gradually deteriorated over the previous two years, but its seriousness was half disguised by his persistent drunkenness. He died on the morning of 24 September 1848. His sudden death came as a shock to the family. He was aged just thirty-one. The cause was recorded as Chronic bronchitis—Marasmus; though, through his recorded symptoms, it is now believed that he was also suffering from tuberculosis. The whole family had suffered from coughs and colds during the fall of 1848, and it was Emily who next became severely ill. She deteriorated rapidly over a two month period, persistently refusing all medical aid until the morning of December 19, when, being so weak, she declared: "If you will send for a doctor, I will see him now." It was far too late. At about two o'clock that afternoon, after a hard, short conflict in which she struggled desperately to hang on to life, she died, aged just thirty. Emily's death deeply affected Anne and her grief further undermined her physical health. Over Christmas, Anne caught influenza. Her symptoms intensified, and in early January, her father sent for a Leeds physician, who diagnosed her condition as consumption, and intimated that it was quite advanced leaving little hope of a recovery. Anne met the news with characteristic determination and self-control. Unlike Emily, Anne took all the recommended medicines, and responded to all the advice she was given. Her health fluctuated as the months passed, but she progressively grew thinner and weaker. In February 1849, Anne seemed somewhat better. By this time, she had decided to make a return visit to Scarborough, in the hope that the change of location and fresh sea air might initiate a recovery, and give her a chance to live. On May 24, 1849, Anne said her good-byes to her father and the servants at Haworth, and set off for Scarborough with Charlotte and their friend Ellen Nussey. En route, the three spent a day and a night in York, where, escorting Anne around in a wheelchair, they did some shopping, and at Anne's request, visited the colossal York Minster. However, it was clear that Anne had little strength left. On Sunday, May 27, Anne asked Charlotte whether it would be easier for her if she return home to die instead of remaining at Scarborough. A doctor, consulted the next day, indicated that death was already close. Anne received the news quietly. She expressed her love and concern for Ellen and Charlotte, and seeing Charlotte's distress, whispered to her to "take courage." Conscious and calm, Anne died at about two o'clock in the afternoon, Monday, May 28, 1849. Over the following few days, Charlotte made the decision to "lay the flower where it had fallen." 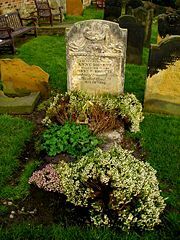 Anne was buried not in Haworth with the rest of his family, but in Scarborough. The funeral was held on Wednesday, May 30, which did not allow time for Patrick Brontë to make the 70-mile (110 km) trip to Scarborough, had he wished to do so. The former schoolmistress at Roe Head, Miss Wooler, was also in Scarborough at this time, and she was the only other mourner at Anne's funeral. She was buried in St. Mary's churchyard; beneath the castle walls, and overlooking the bay. Charlotte commissioned a stone to be placed over her grave, with the simple inscription "Here lie the remains of Anne Brontë, daughter of the Revd. P. Brontë, Incumbent of Haworth, Yorkshire. She died, Aged 28, May 28th, 1849." Anne was actually twenty-nine at her death. A year after Anne's death, further editions of her novels were required; however, Charlotte prevented re-publication of Anne's second novel, The Tenant of Wildfell Hall. In 1850, Charlotte wrote damningly "Wildfell Hall it hardly appears to me desirable to preserve. The choice of subject in that work is a mistake, it was too little consonant with the character, tastes and ideas of the gentle, retiring inexperienced writer." This act was the predominant cause of Anne's relegation to the back seat of the Brontë bandwagon. Anne's novel was daring for the Victorian era with its depiction of scenes of mental and physical cruelty and approach to divorce. The consequence was that Charlotte's novels, along with Emily's Wuthering Heights, continued to be published, firmly launching these two sisters into literary stardom, while Anne's work was consigned to oblivion. Further, Anne was only twenty-eight when she wrote The Tenant of Wildfell Hall; at a comparable age, Charlotte had produced only The Professor. The general view has been that Anne is a mere shadow compared with Charlotte, the family's most prolific writer, and Emily, the genius. This has occurred to a large extent because Anne is very different, as a person and as a writer, from Charlotte and Emily. The controlled, reflective camera eye of Agnes Grey is closer to Jane Austen's Persuasion than to Charlotte Brontë's Jane Eyre. The painstaking realism and social criticism of The Tenant of Wildfell Hall directly counters the romanticized violence of Wuthering Heights. Anne's religious concerns reflected in her books and expressed directly in her poems, were not concerns shared by her sisters. Anne's subtle prose has a fine ironic edge; her novels also reveal Anne to be the most socially radical of the three. Now, with increasing critical interest in women authors, her life is being reexamined, and her work reevaluated. A re-appraisal of Anne's work has begun, gradually leading to her acceptance, not as a minor Brontë, but as a major literary figure in her own right. ↑ 1.0 1.1 Fraser, The Brontës, p. 4. ↑ Barker, The Brontës, p. 2. ↑ Barker, The Brontës, p. 14. ↑ Barker, The Brontës, p. 41. ↑ Barker, The Brontës, p. 43. ↑ Barker, The Brontës, p. 36. ↑ Fraser, The Brontës, p. 12-13. ↑ Fraser, The Brontës, p. 15. ↑ Barker, The Brontës, p. 48. ↑ Fraser, The Brontës, p. 16. ↑ Barker, The Brontës, p. 61. ↑ Barker, The Brontës, p. 86. ↑ Barker, The Brontës, p. 102-104. ↑ Fraser, The Brontës, p. 28. ↑ Fraser, The Brontës, p. 30. ↑ Fraser, The Brontës, p. 29. ↑ 17.0 17.1 Fraser, The Brontës, p. 31. ↑ Fraser, The Brontës, p. 35. ↑ Fraser, The Brontës, p. 44-45. ↑ Barker, The Brontës, p. 150. ↑ Fraser, The Brontës, p. 45. ↑ Fraser, The Brontës, p. 45-48. ↑ Barker, The Brontës, p. 154-155. ↑ Fraser, The Brontës, p. 48-58. ↑ Fraser, The Brontës, p. 52-53. ↑ Fraser, A Life of Anne Brontë, p. 39. ↑ Barker, The Brontës, p. 237-238. ↑ Fraser, The Brontës, p. 113. ↑ Barker, The Brontës, p. 307. ↑ Barker, The Brontës, p. 308. ↑ Barker, The Brontës, p. 318. ↑ Barker, The Brontës, p. 344. ↑ Barker, The Brontës, p. 403. ↑ Barker, The Brontës, p. 329. ↑ Barker, The Brontës, p. 358-359. ↑ Barker, The Brontës, p. 404. ↑ Barker, The Brontës, p. 409. ↑ Barker, The Brontës, p. 450. ↑ Barker, The Brontës, p. 574. ↑ Barker, The Brontës, p. 451. ↑ Barker, The Brontës, p. 480. ↑ Barker, The Brontës, p. 491. ↑ Barker, The Brontës, p. 525. ↑ Barker, The Brontës, p. 539. ↑ Barker, The Brontës, p. 540. ↑ Barker, The Brontës, p. 557. ↑ Barker, The Brontës, p. 559. ↑ Barker, The Brontës, p. 532. ↑ 51.0 51.1 Barker, The Brontës, p. 564. ↑ Barker, The Brontës, p. 568. ↑ Barker, The Brontës, p. 576. ↑ Barker, The Brontës, p. 588. ↑ Barker, The Brontës, p. 587. ↑ Barker, The Brontës, p. 594. ↑ Barker, The Brontës, p. 575. ↑ Fraser, The Brontës, p. 387. ↑ Barker, The Brontës, p. 654. Barker, Juliet. The Brontës. St. Martin's Pr. ISBN 0-312-14555-1. Chitman, Edward. A Life of Anne Brontë. Oxford: Blackwell Publishers, 1991. ISBN 0-631-18944-0. Fraser, Rebeca. The Brontës: Charlotte Brontë and her Family. Crown Publishers, 1988. ISBN 0-517-56438-6. Gérin, Winifred. Anne Brontë. Allen Lane, 1976. ISBN 0-713-90977-3. All links retrieved March 23, 2016. This page was last modified on 23 March 2016, at 15:13.